Graduation is a very big mark in a person’s life, but it is often filled with mixed emotions of fear and nostalgia. 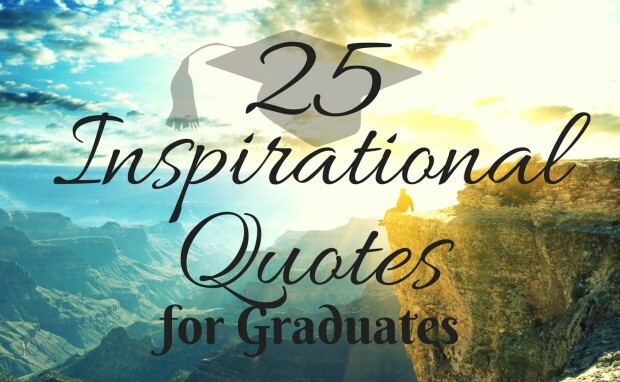 When your student is facing to leave behind his time of study, friends and focused pursuit, encourage him or her with quotes that get the inspiration flowing and serve as a reminder of the great things to come. Push towards success and do not fear failure. Let your accomplishments build your self-esteem and self-confidence. We don’t cry because these moments are over, we smile because they happened and there are so many more to come. When you are bold enough to do the knocking, you often find opportunity opens the door to you. Be true to yourself. Follow your passions. Go wherever your heart takes you. The best things in life aren’t always free. Your passion will demand sweat, tears and money to become a reality. You will feel scared. You will feel like quitting. These are all just signs that your dreams are big enough to be worth pursuing. Don’t spend your time counting down the days – make every day count. You can take the road less traveled, or you could go where there are no other travelers and leave a trail. What makes leaving bearable is knowing that you take the best parts with you. You can’t travel across the ocean without the courage to leave the shore and push on when nothing else seems in sight. Moving on up starts with placing one foot in front of the other. Aim for the moon – even if you don’t get there, you’ll be in good company among the stars. Chase your wildest dreams and expect to be bitten and scratched along the way. The days you leave behind are bright, but let the days to come be brighter. Treasure your memories, but don’t get wrapped up in gazing on them too often or you will miss the opportunity to make more. Tomorrow has the same potential for greatness as yesterday did, only you are a bit wiser to the system and prepared to make your efforts count. Consider using your favorite quote or saying on your school’s 8th Grade Graduation or Senior Class T-Shirts. Graduation students often fondly reminisce of these days gone past, so give them something that brings back good memories and spurs them on towards future success.